“I’m bored what can I do” is not a shout you hear much around Kingston Kayak outdoor pool during the school summer holidays, Why? Every year the cadets and young coaches of the club provide the man power to run a five week long summer school. 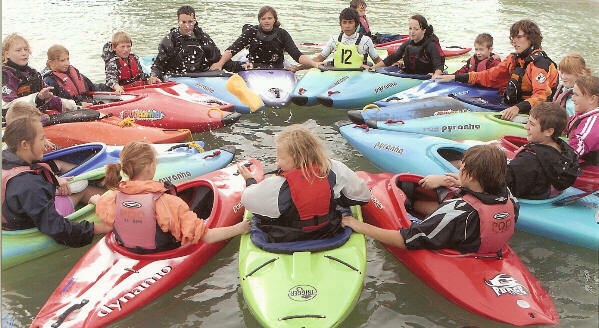 Every Monday to Friday, three times a day the youth section along with club coaches go onto the water to help the kids of Hull get to grips with the sport of kayaking whilst doing so they have lots of fun playing games and meeting new friends. Summer school isn’t just used to help the local youth get into kayaking it also helps us as young coaches or cadet leaders gain the experience needed to take the next step up the coaching ladder. It allows us to widen our capabilities and learn different coaching ideas from other coaches while testing out new ideas for games. The club has always enjoyed running the summer school as it helps to bring in new members and gives Hull a good name when members enter competitions all around the country; at different disciplines i.e. polo, slalom and marathon. Joy Davis, 8 Saxondale, Hull. HU4 7SH.